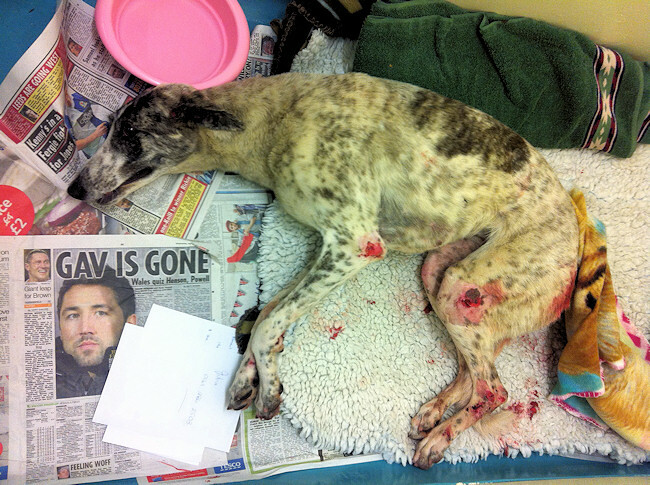 In June 2012, we were contacted by an RSPCA inspector who had been called to the horrific scene of a 2 year old female Lurcher laying badly injured at the side of the M56 Motorway. Hatty (Or Hattie (?) 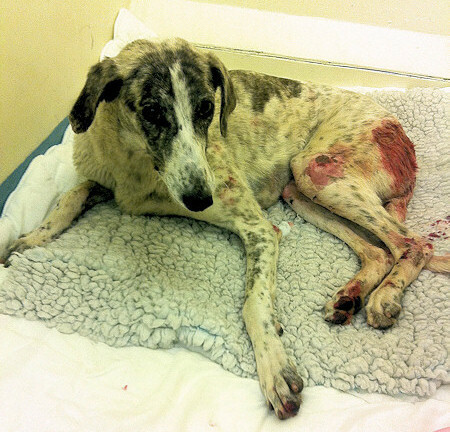 as she became known) had fallen from a moving vehicle onto the M56 Motorway and was then abandoned by her owner, who returned to look at her and then drove off. The RSPCA Inspector arranged for local vets to attend the scene and tranquilise Hatty, to be able to move her to Beech House Vets in Warrington for assessment. In line with normal RSPCA procedures, once the inspector had ensured that Hatty was receiving Veterinary treatment , she was transferred to our care, as we are the local RSPCA branch that covers that area. 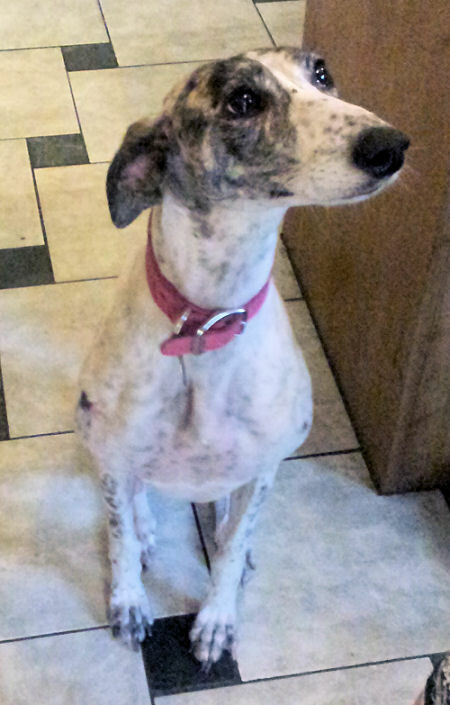 Hatty had a fractured pelvis and fractured surrounding joints which required a surgical plate and 6 screws inserted into her pelvis near the hip joint. She also had, as you can see from the pictures, serious skin lacerations from falling from a fast moving car. She also had other injuries including a broken tail bone and needed surgery on her feet to patch her terrible injuries. Hatty stayed with the Vets for a month whilst she recovered sufficiently to be moved and was cared for around the clock by the Veterinary team and also by members of Warrington Animal Welfare who work at Beech House Veterinary practice. 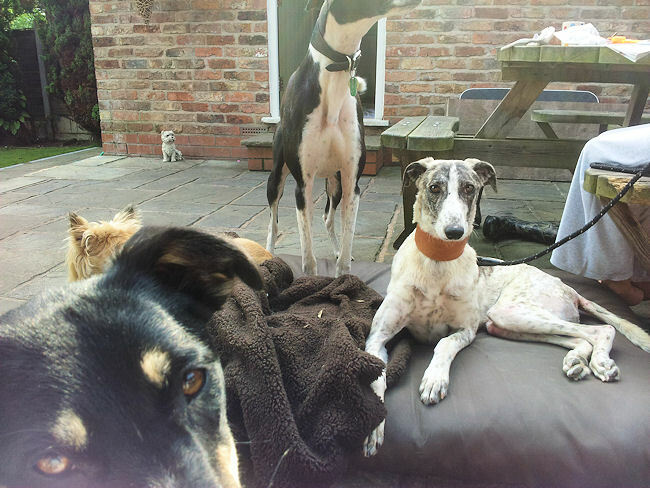 Eventually she was able to be moved to a foster home where she could recover in more natural surroundings, with other dogs for company. It was a difficult journey and she shook uncontrollably at first sight of the car, eventually settling down enough to make the short journey. 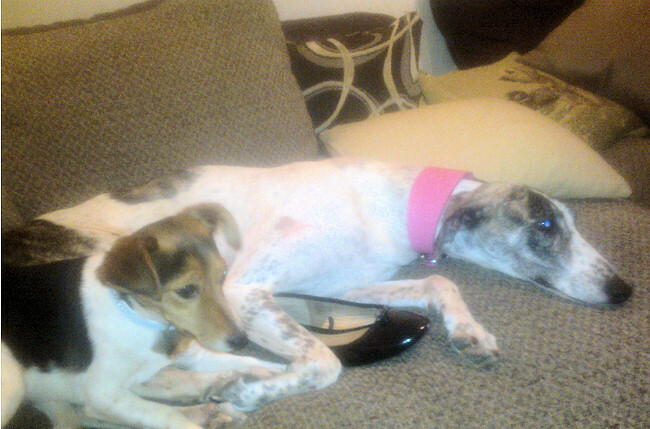 Once at the foster home she began to settle with the two other Lurchers belonging to Annie the fosterer. 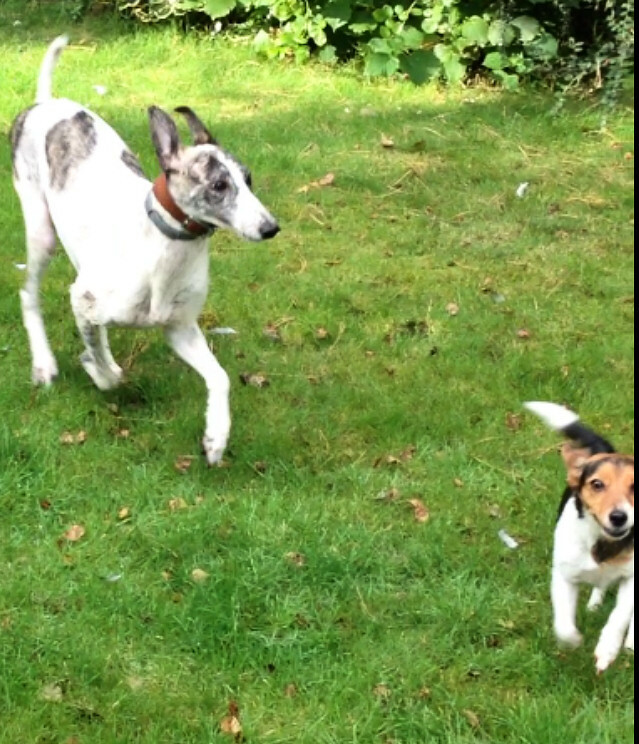 Hatty has bonded really well with Twiglet , one of Jack Russell’s at the foster home and this has really helped settle her down there. It was hoped that hatty would be able to have a new life with Paul, who stopped his car and stayed with her at the roadside until help arrived. He visited her regularly at the foster home, but eventually had to make the sad decision that he could not rehome Hatty when she is ready, as she would continue to require the constant care and help that is almost impossible in a domestic situation. Hatty continues to make progress, but has a long and difficult path to recovery ahead of her. She reacts very badly to attempts to move her by car, making it an almost impossible task to transport her to the Vets for the regular ongoing treatment that she needs and for other recuperation such as Hydro-therapy. Whatever Hatty is doing, Twiglet is always by her side and they have formed a strong bond. I would like to take this opportunity to thank everyone who has contributed to and supported Hatty in her fight for recovery, either by way of hands on care or by making contributions to her medical costs. We will post further updates here when we have them. Here is a quick update on Hatties progress. She has come a long way in twelve months. She’s so happy now and has actually started to wag her tail, something Frances never thought she would do!